Libby's Little Addiction: Christmas in July! I'm melting! I'm melting!! Ugh, 105 degrees in central Texas today, with a heat advisory in effect. It's so hot my 3 year old son refused to go to the *POOL* this morning because he didn't want to leave the house! What's a girl to do on a day like today? Why, make a snowman card, of course!! :-D And the timing was perfect since Pamela is having a "Christmas in July" sale over at FireCracker Designs by Pamela! You can read about the sale deets on her blog but basically it's buy 2 Christmas sets, get the 3rd free! WOOHOO! I just loooooove this snowman image, it's one of my all-time favorite FCD sets, Love Never Melts (along with his snowladyfriend in Gifts of Love!). :-) A snowman warming his backside on the fire, what is cuter than that?!? I used Pamela's latest sketch for this card as well, and it worked out quite nicely! I added a little liquid applique to the fuzzy part of his hat, fun! I was almost finished with the card and saw the rhinestone flourish hanging above my desk and thought "A-HA, what fun smoke that would make!" and once I went with some bling, I couldn't resist glitterfying the entire snowman with some Stickles!! The fun, vibrant colors are this week's Color Throwdown - Real Red, Tempting Turquoise & Kiwi Kiss. It was also last week's Stamp Something challenge, sponsored by Pamela, to make a Christmas in July card, but as usual I'm a day late and dollar short on that!! Well I don't know about you but I am feeling cooler already. :-) Thanks for stopping by today! WOWZA!! I LOVE this! the glitter on the snow is just perfect, and the 'smoke' bling rawks!!!! OMW what a fabuous winter card! Your swirled embossing is perfect with the swirly flourished bling! Love that precious snowman! Wow, bless you in that blistering heat! Great idea to think cool with a snowman card, I love all the glitter and the 'smoke' drifting to the sky. Have a great weekend, hope there's a break from the heat! Hi, I came from Rainy's blog. The snowman card is adorable. I like the added touch of shade on the snowmans backside. The card reminded me of a cute joke. A kndergarten teacher is teaching her students the Pledge of Allegiance and instructs the kids to place their right hand over their heart. One little boy places his hand on his butte cheek. Asked why, the boy said, "Whenever my Nana hugs me she pats my cheek and says, "Bless your little heart." Oh this is sooooo cute! Until I saw the forecast--holy toledo, you need to move somewhere cooler! Glad you could "cool off" with this cute snowman! 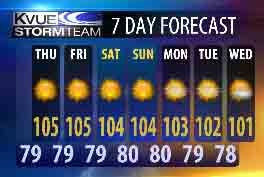 oh goodness...great card and those temps...I am glad I am in the NW...we sent the 100's to you I think! Gorgeous! Love the fluffiness! It has been super rainy this past week but I still don't envy that heat! Brrr, you are making me cold. Love the applique on this card. Beautiful, Libby! I love all the dimension, texture and bling! Thanks for playing along with us again! Oh my gosh....hot, hot, hot!! I can see why you're thinking snowmen...and yours is sooooo cute too!! Lovin' all of the bling!! How cute!!! Great way to cool off, LOL! Thanks for playing the Throwdown! Hope to see you again next time!